Is it just us, or do you also have trouble getting out of bed and out the door quickly in the morning? Then this fresh juice recipe gives you that burst of energy you need. The grapefruit and lemon are bracing while the Asian pear mellows it all out a bit with sweetness. It's the perfect combo to kickstart your morning. We also love this juice when we don't have much of an appetite for breakfast but just need a little something to get us through the A.M. If you can't find Asian pear (or want another option), swap in a tart green apple. Celery is also a nice refreshing option to add. To save time in the morning, peel the lemon and grapefruit the night before and keep it in the fridge. Then when you wake up, all you have to do is zip it in the juicer. 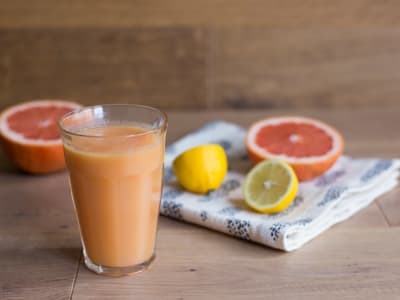 You can also blend the Asian pear and grapefruit in a high-speed blender adding the juice from the lemon, for a smoothie version, if you want to keep the fiber in your drink! Per Serving: 77 calories; 0g fat; 19.6g carbohydrates; 1g protein; 0mg cholesterol; 0mg sodium. instead of fresh squeezed OJ, i used my new juicer to make a batch of this juice for mimosas! such a fun switch up for a girls' brunch. This is my favorite season, when grapefruit is especially fresh! So delicious! Such a juicy, yummy smoothie.